SOLUTIONS searches for new and improved tools, models and methods to support decisions in environmental and water policies. SOLUTIONS searches for new and improved tools, models, and methods to support decisions in environmental and water policies. Therefore, the overall goal of the project is to produce consistent solutions for the large number of legacy, present and future chemicals posing a risk to European water bodies with respect to ecosystems and human health. Researchers typically communicate via scientific papers and/or presentations. However, these dissemination pathways of scientific results and products often do neither address end-user requirements nor do they reach decision makers in management, regulation and industry. SOLUTIONS purpose is to digest and condense the project outcomes (in terms of analytical tools, computational models, databases) into applicable guidelines and operational science-policy interfaces, as for example the so-termed piece of software RiBaTox (Web-based decision support system for River Basin specific Toxicants) to assist with the assessment, prioritisation and abatement of emerging pollutants. 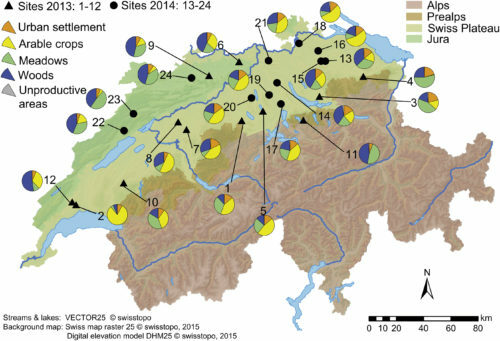 SOLUTIONS applied chemical and biological analyses to assess the micropollutant burden during low flow conditions up- and down-stream of three wastewater treatment plants discharging into small streams in the Swiss Rhine catchment Neale, Munz et al., 2017. Chemical analysis included 405 organic substances, while the applied bioassays comprised 13 different endpoints, representing different stages of cellular toxicity pathways including xenobiotic metabolism, receptor-mediated effects and adaptive stress responses, as well as whole organism effects. As expected, chemical and bio-analyses showed higher chemical concentrations and effects for effluent samples, with the lowest chemical concentrations and effects in most assays for the upstream sites. While chemical analysis showed differences in the chemical pollution profiles at the different sampling locations, bioanalysis provided information about the mixture effects of additional chemicals in the samples. Mixture toxicity modeling was performed to assess the contribution of detected chemicals to the observed effect. For most bioassays, very little of the observed effects could be explained by the detected chemicals which emphasizes the importance of combining bioanalysis with chemical analysis to provide a more complete picture of the micropollutant burden. However, the lack of effect data for the detected micropollutants in the different assays was a major limitation and more data is needed for a significant improvement of the mixture modeling. Further, both chemical and bio-analyses showed relevant contribution of diffuse sources from upstream during low flow conditions – besides the significant contribution of wastewater effluents to the micropollutant burden downstream - suggesting that improved wastewater treatment technology will not completely reduce the micropollutant burden, which renders additional source control measures also necessary. MetFrag is a freely available software for the annotation of accurate tandem mass spectra of small molecules such as metabolites and substances of environmental interest. Annotation is a first and critical step for the identification of a molecular structure. Candidate molecules from various databases are fragmented in silico and matched against mass to charge values. A score calculated using the fragment peak matches indicates the quality of the candidate spectrum assignment. 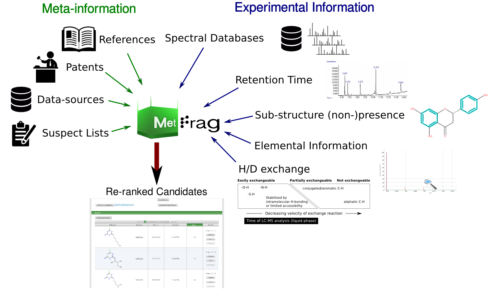 MetFrag, launched in 2010, was one of the first approaches combining compound database searching and fragmentation prediction for the identification of small molecules from tandem mass spectrometry data. Since then many new approaches have evolved, including MetFrag itself within SOLUTIONS. Ruttkies et al. 2016 details the latest developments to MetFrag and its use in small molecule identification since the original publication. A great benefit is the addition of different information sources, beyond in silico fragmentation, into the identification workflow, reducing user workloads and improving the structure elucidation process. 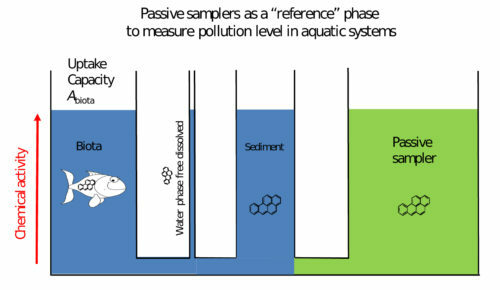 Passive sampling is a powerful tool that can conveniently be used for monitoring organic compounds in water and other environmental compartments. It has been designed to provide estimates of freely dissolved concentrations which have been shown to be in many cases most appropriate to explain exposure and adverse effects in biota. This downloadable SOLUTIONS internal deliverable provides a practical guidance on the use of passive samplers for monitoring organic pollutants in water. This guidance should assist users wishing to implement passive sampling methods in their research or monitoring work, but also more experienced users in the use of the available methods according to the state-of-the art. It addresses principles of passive sampling, sampler preparation, field deployment, laboratory processing, chemical analysis, calculation of aqueous concentrations and associated uncertainty considerations, as well as quality assurance. Practical examples of sampler operation and sample processing procedures developed and applied within SOLUTIONS are also provided. Additionally, SOLUTIONS pursues the successful implementation and application of sampling approaches for a more holistic monitoring of water quality. Schulze et al. 2017 presents a novel on-site large volume solid phase extraction LVSPE device tailored to fulfill the requirements for the successful effect-based and chemical screening of water resources. Water quality monitoring is challenged with providing the basis for safeguarding the environment against adverse biological effects of anthropogenic chemical contamination. This conceptual paper by Altenburger et al. 2015 describes three routes to link the occurrence of chemical mixtures to the assessment of adverse biological effects. 1. Advanced multi-residue target and non-target screening techniques covering a broader range of chemicals co-occurring in the environment. By improving sensitivity and detection limits for known bioactive compounds of concern, new analytical chemistry data can be used to characterize priority mixtures. 2. Bioanalytical tools explored to provide aggregate measures integrating all components that produce adverse outcomes even for mixtures of varying compositions. 3. 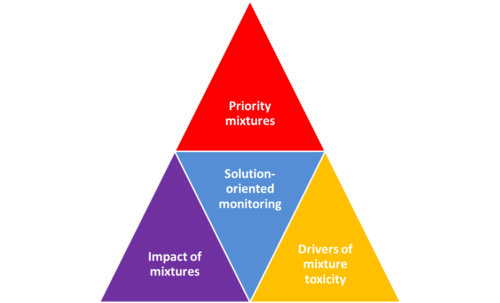 EDA advanced to identify major drivers of mixture toxicity. These approaches are explored in studies at Danube and Rhine basins, and also in rivers of the Iberian Peninsula. In addition to generic approaches to estimate emissions of organic chemicals, SOLUTIONS scientists have been developing techniques to estimate emissions for specific substances or substances groups in case studies. Lindim et al. 2015 estimated the emissions of perfluorooctane sulfonic acid PFOS, and perfluorooctanoic acid PFOA to surface waters and used an application of STREAM-EU to the Danube River catchment to verify the accuracy of estimates. Results obtained showed that the best estimates for PFOS and PFOA emissions in the Danube region are obtained by considering the combined contributions of human population, wealth (based on local gross domestic product GDP) and wastewater treatment. Human population alone cannot explain the levels of PFOS and PFOA found in the Danube catchment waters. Introducing wealth distribution information in the form of local GDPs improves emission estimates markedly, likely by better representing emissions resulting from consumer trends, industrial and commercial sources. The largest source of PFOS and PFOA to freshwater are wastewater treatment plants. Lindim et al. 2016b completed an emissions inventory for 54 top consumed human pharmaceuticals in Sweden was done based on national consumption data, human metabolic rates and wastewater treatment removal rates. The highest emissions to water were found for Metformin, Furosemide, Gabapentin, Atenolol and Tramadol. The Spatially and Temporally Resolved Exposure Assessment Model for European basins STREAM-EU model has already seen three published applications. Lindim et al. 2016 simulate the environmental fate of perfluoroctanesulfonic acid PFOS, and perfluorooctanoic acid PFOA in the Danube River basin and compare model predictions to recent monitoring data. The model predicts PFOS and PFOA concentrations that agree well with measured concentrations for large stretches of the river. This was later up-scaled to the eleven most populated European river catchments to provide a European-wide perspective on the contamination with PFOS and PFOA. STREAM-EU model was used to predict the water concentrations, estuarine export and retention of these substances. Emissions of PFOS and PFOA to those catchments were calculated based on a previously published method. The simulation results are in reasonable agreement with field data, and indicate widespread exceedence of the surface water Environmental Quality Standards for PFOS. A third application provides an exposure assessment for 54 pharmaceuticals in Swedish surface waters. Again, the water concentrations, estuarine export and retention of these substances were quantified. In an on-going effort these results are being used to estimate effects on Swedish river ecosystems. SOLUTIONS scientists developed a novel dynamic mass balance model for predicting the environmental fate of organic contaminants in river basins Lindim et al. 2015. It is based on a pre-existing open source water quality modelling framework Delft3D-WAQ and has been linked to the Europe wide hydrology model E-Hype by SMHI. STREAM-EU goes beyond the current state-of-the-science in that it can simulate spatially and temporally-resolved contaminant concentrations in all relevant environmental media (surface water, groundwater, snow, soil and sediments) at the river basin scale. The model can currently be applied to multiple organic contaminants in any river basin in Europe. Freshwater environments are contaminated with complex mixtures of chemicals posing risks to ecosystems & human health. One core goal of the European Environmental Action plan 2020 is to reach a non-toxic environment. Chemical footprints represent the amount of water in a country or a city that is required to dilute all emissions to concentrations that do neither pose a risk to ecosystems nor to human health. Thus, chemical footprints as applied by Zijp et al. 2014 are a valuable tool to assess toxic impacts against safe boundaries for a specific regions and help to prioritize abatement options. This study assesses the uncertainty with respect to 1st-order biodegradation rate constants of emerging organic compounds (EOCs) for soil and groundwater reported in the literature, as these values are needed to predict fate of EOCs in the environment. For the majority of compounds, the reported degradation rate constants vary over more than three orders of magnitude. Correlation to factors that are well known to affect the degradation rate, such as temperature or redox condition was weak. No correlation at all was found with results from available quantitative structure-activity relationship models. This suggests that many unknown site specific or experimentally specific factors influence the degradation behavior of EOCs in the environment. Thus, local and catchment scale predictive models to estimate EOC concentration at receptors e.g. receiving waters or drinking water wells, need to consider the large uncertainty in 1st-order rate constants. As a consequence, applying rate constants that were derived from one experiment or field site investigation to other experiments or field sites should be done with extreme caution. In collaboration with Ecoimpact, SOLUTIONS assessed the chemical exposure and the concentration patterns of organic micropollutants upstream, downstream and at effluents of 24 Swiss wastewater treatment plants Munz et al., 2017. The aim was to determine whether the risk for aquatic organisms living in wastewater-impacted streams is mainly driven by higher concentrations of pharmaceuticals and other typical household chemicals, or if pesticides play an important role also when released during low flow conditions. The streams were located across independent catchments with different land uses and were grab sampled during low flow conditions at eight time points. SOLUTIONS observed regular detections of micropollutants over all sites. While pharmaceuticals and other typical household chemicals constituted the highest loads, many pesticides were detected only during episodic events. Nevertheless, occasional concentration peaks were observed for pesticides, and the toxic pressure was mainly driven by a few pesticides and the anti-inflammatory drug diclofenac. The comparison with macroinvertebrate data underlined the importance of pesticides in wastewater-impacted streams. This relevance of pesticides also during low flow conditions seems to be typical for catchments where urban and agricultural land use co-occur as it is the case for many European countries. Mediterranean rivers are different from Northern & Central European in terms of hydrological regime, climate conditions, socio-economics; all leading to differences in the nature and relative importance of existing environmental stressors. To identify the most relevant organic pollutants in this kind of scenarios, characterized by frequent water scarcity episodes and heavy human pressure, over 200 organic priority and emerging pollutants were comprehensively monitored in water, sediment and biota from 4 river basins and further prioritized on the basis of their occurrence, toxicity, and physical-chemical data. We provide a prioritization of contaminants relevant to Iberian rivers to support water authorities with respect to the set up of River Basin Management Plans. River bank filtration RBF is a common technique for the pre-treatment of surface water for drinking water supply. During subsurface passage from the river towards extraction wells, undesired substances, such as pathogenic virus or contaminants shall be removed. 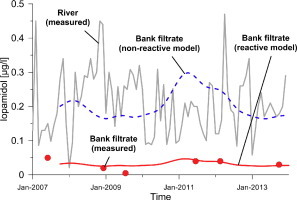 While many river contaminants cannot be detected after bank filtration several emerging pollutants such as the pharmaceutical carbamazepine are fully persistent even after more than 3 years of transfer time. This study by Hamann et al. 2016 is one of very few reporting on the long-term field-scale behavior of organic micropollutants. It highlights the efficiency of RBF for water quality improvement as a pre-treatment step for drinking water production. Pharmaceuticals are considered a risk for various functions of surface waters. Enhanced purification at sewage treatment plants (STPs) can present a solution. But which STPs should be upgraded first? Coppens et al. 2015 investigated to what degree individual treatment plants affect the water quality in receiving surface waters, by using mathematical modelling. The individual STPs were ranked with respect to their overall negative impact on receiving waters with certain functions, in particular a provision of raw drinking water, and b nature protection. This provided a clear ranking of 345 Dutch STPs, as shown in the figure (red dots are all STPs, blue dots are priority STPs for protecting drinking water resources and green dots are priority STPs for nature protection). SOLUTIONS scientists are in the process of up-scaling this approach for the whole Rhine catchment area, one of SOLUTIONS three case study areas. The water system provides fundamental services to society: industries, municipalities and agriculture withdraw, use and return water and demand water quality for intended purposes. As both water use and chemical emissions rise, increasing problems can be expected at the nexus of the chemical lifecycle and the water cycle. Currently, action on deterioration of water quality by chemicals is focused mostly on problem and risk analysis, while little attention is paid to mitigation options. Moreover, the intensification of current regulatory pathways presumably cannot yield a full solution to reach the policy goal of a non-toxic environment, so additional approaches seem warranted. This study by van Wezel et al. 2017 collates and evaluates mitigation options for chemical water quality improvement. These include mitigation options during the design, registration and authorization, production, use and waste phases, and ultimately technological interventions at the point of use, the point of environmental entry or at the point of a susceptible function of the water. Chemical pollution and reducing risks to human health and the environment are in focus in a large number of European regulations and directives, but also as multilateral environmental agreements. 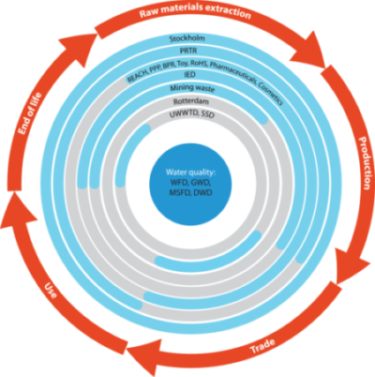 Diverse international pieces of legislation and regulatory frameworks cover different parts of the chemical life-cycle which can be represented by five categories: Raw material extraction; Production; Trade; Use and End-of-life. An improved coordination and cooperation between the different regulatory frameworks aimed at reducing chemical risks to the environment and human health, can as well lead to an improved implementation of the Water Framework Directive across Europe. SOLUTIONS has developed this freely available on-line tool/database for the search of chemicals that are listed in directives, conventions and international agreements, and other initiatives of relevance for the fulfillment of the goals established by the WFD. Contents: Key Findings with illustrations / Why we createdm this broschure at the end of the SOLUTIONS European project? A circulation to unauthorised third persons is not allowed. Water quality monitoring is challenged with providing the basis for safeguarding the environment against adverse biological effects of anthropogenic chemical contamination. This requires advanced experimental techniques for sampling, chemical and biological analytics, as well as strategies of how to employ tools for specific monitoring purposes. This product describes three routes to link the occurrence of chemical mixtures to the assessment of adverse biological effects. 1. Advanced sampling, multi-residue target and non-target screening techniques covering a broader range of chemicals co-occurring in the environment. By improving sensitivity and detection limits for known bioactive compounds of concern, new analytical chemistry data can be used to identify river-basin specific pollutants. 2. Bioanalytical tools explored to provide aggregate measures integrating all components that produce adverse outcomes even for mixtures of varying compositions and thus allow comprehensive impact assessment. 3. Effect-directed analysis (EDA) advanced to identify major drivers of mixture toxicity by improving cause-effect relationships. The approaches suggested were explored in studies at Danube and Rhine basins, and also in rivers of the Iberian Peninsula. Guidance for use of specific monitoring tools is also provided through the SOLUTIONS RiBaTox software. SOLUTIONS developed an integrated sequence of interlinked models. This “model train” aims to estimate the risk of a (new) emerging pollutant based on very limited information only: the use volume and category, and the molecular structure. The model train con sists of four major components: 1 a generic emissions model; 2 a spatially and temporally explicit fate and transport model STREAM-EU, 3 a sequence of models to estimate substance properties and 4 models to calculate risk for human health and ecology. The components have been developed and are in the final stage of evaluation, by comparison to field data from the SOLUTIONS Case Studies (Danube, Rhine and Spanish Case Studies). The model train has been run for about 1,800 chemicals for the whole of Europe (see Figure). The results demonstrated that the model train is a suitable tool to better understand the risks associated to emerging pollutants on a European scale. They provide a continuous picture in time and space that cannot be derived from field data. They allow quantitative risk assessments for “data poor” emerging chemicals. Moreover, they allow to perform “what if” scenarios, and to investigate abatement options and the pollutants of tomorrow. A series of such applications has been produced (see “Results”[Add a link at a later stage]) and is now being analysed and published. To provide and communicate a common knowledge base to stakeholders in order to understand the behavior of environmental pollutants and to enable their management by supporting the processes of prioritisation, emission/limit threshold setting and abatement option selection. 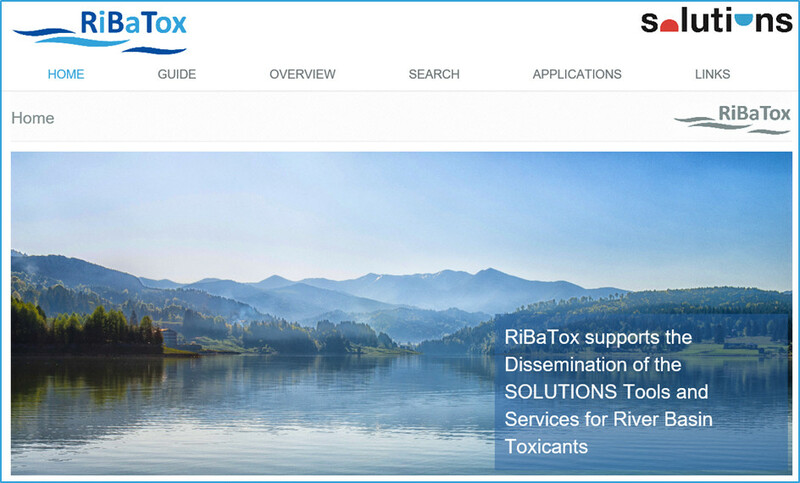 RiBaTox (Guide to Tools and Services for River Basin Toxicants) is an online web-based service with open access and supports the dissemination of the results of the SOLUTIONS project. It is intended at the national, regional and local levels for policy makers, their technical staff as well as water managers, but also for scientists and is also accessible to the public at large. New and improved models, tools, guidelines and databases are systematically documented and translated into SOLUTIONS ‘Tools and Services’ designed to provide support to your challenges related to river basin toxicants. The output of RiBaTox are descriptions of these Tools and Services in a so called Fact Sheet format, each downloadable as pdf. Please note that access to actual Tools and Services as such is not included in RiBaTox since it is not intended as a system where actual calculations are made or databases are directly consulted. For more detailed information or to receive and/or use the actual Tool or Service you are directed to references such as scientific publications, or may contact the developer(s) or supplier(s) of the Tool or Service directly based on the provided contact information. Considering different types of end-users requiring more or less guidance to find a recommended Tool or Service, RiBaTox provides as options a Guide based on a decision tree for end-users with lower technical background requiring some assistance, an Overview based on categories for end-users with some technical background and a Search function for end-users requiring the least or no assistance. More detail about the use of these options can be found in the RiBaTox Manual. RiBaTox provides also a download of the Full Set of Fact Sheets of available SOLUTIONS Tools and Services. Water is a vital resource for natural ecosystems and human life, and assuring a high quality of water and protecting it from chemical contamination is a major societal goal in the European Union. The Water Framework Directive WFD and its daughter directives are the major body of legislation for the protection and sustainable use of European freshwater resources, nevertheless its practical implementation with regard to chemical pollution has faced certain challenges. SOLUTIONS and the monitoring network NORMAN have joined efforts in identifying several present-day challenges for monitoring, prioritizing, assessing, and managing risks posed by chemicals, and in evaluating the state-of-the-art of the science concerning those issues. 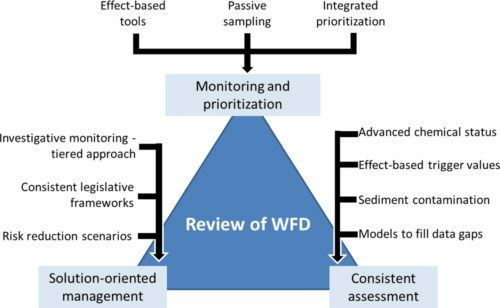 In this article SOLUTIONS & NORMAN provide 10 recommendations to be addressed during the WFD review and updating processes in order to: i. improve monitoring and strengthen comprehensive prioritization; ii. foster consistent assessment; and iii. support solution-oriented management of surface waters. In May/June 2019, all Policy Briefs will be published as a scientific brochure in Environmental Sciences Europe. 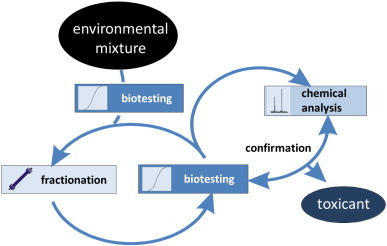 Mixture effects in samples of multiple contaminants – An inter-laboratory study with manifold bioassays. Future water quality monitoring – Adapting tools to deal with mixtures of pollutants in water resource management. It is time to develop ecological thresholds of toxicological concern to assist environmental hazard assessment. Towards the review of the Water Framework Directive: Recommendations for more efficient assessment and management of chemical contamination in European water resources. Effect-directed analysis supporting monitoring of aquatic environments — An in-depth overview. The Challenge: Prioritization of emerging pollutants. The SOLUTIONS project: Challenges and responses for present and future emerging pollutants in land and water resources management. Micropollutants in European rivers: a Mode of Action Survey to support the development of Effect-Based Tools for water monitoring. Elimination of drugs of abuse and their toxicity from natural waters by photo-Fenton treatment. Towards spatially smart abatement of human pharmaceuticals in surface waters: Defining impact of sewage treatment plants on susceptible functions. Aquatic exposures of chemical mixtures in urban environments: Approaches to impact assessment. Bioassay battery interlaboratory investigation of emerging contaminants in spiked water extracts – Towards the implementation of bioanalytical monitoring tools in water quality assessment and monitoring. Multicriteria approach to select polyaromatic river mutagen candidates. Reconciling monitoring and modeling: An appraisal of river monitoring networks based on a spatial autocorrelation approach – emerging pollutants in the Danube River as a case study. The uncertainty of biodegradation rate constants of emerging organic compounds in soil and groundwater – A compilation of literature values for 82 substances. Functional genomics assessment of narcotic and specific acting chemical pollutants using E. coli. Functional genomic assessment of 2, 2-bis (bromomethyl)-1, 3-propanediol induced cytotoxicity in a single-gene knockout library of E. coli. Classification and toxicity mechanisms of novel flame retardants (NFRs) based on whole genome expression profiling. The fate of organic micropollutants during long-term/long-distance river bank filtration. Effect-directed analysis (EDA) of Danube River water sample receiving untreated municipal wastewater from Novi Sad, Serbia. Optimization of LC-Orbitrap-HRMS acquisition and MZmine 2 data processing for nontarget screening of environmental samples using design of experiments. Linking mutagenic activity to micropollutant concentrations in wastewater samples by partial least square regression and subsequent identification of variables. Metabolic transformation as a diagnostic tool for the selection of candidate promutagens in effect-directed analysis. Chemical activity and distribution of emerging pollutants: Insights from a multi-compartment analysis of a freshwater system. Anthropogenic Stressors Shape Genetic Structure: Insights from a Model Freshwater Population along a Land Use Gradient. Body burden of pesticides and wastewater-derived pollutants on freshwater invertebrates: Method development and application in the Danube River. Differential expression of CYP1A1 and CYP1A2 genes in H4IIE rat hepatoma cells exposed to TCDD and PAHs. Screening and risk management solutions for steroidal estrogens in surface and wastewater. Toward understanding the impacts of sediment contamination on a native fish species: transcriptional effects, EROD activity, and biliary PAH metabolites. Impact of untreated wastewater on a major European river evaluated with a combination of in vitro bioassays and chemical analysis. Effect-based and chemical analytical methods to monitor estrogens under the European Water Framework Directive. Aerobic activated sludge transformation of vincristine and identification of the transformation products. Chapter 15 – High-Resolution Mass Spectrometry in the Effect-Directed Analysis of Water Resources. Comprehensive Analytical Chemistry, Volume 71, 2016, Pages 433–457. Applications of Time-of-Flight and Orbitrap Mass Spectrometry in Environmental, Food, Doping, and Forensic Analysis. Biotransformation in the zebrafish embryo – temporal gene transcription changes of cytochrome P450 enzymes and internal exposure dynamics of the AhR binding xenobiotic benz[a]anthracene. An ecotoxicological view on neurotoxicity assessment. Can Environmentally Relevant Neuroactive Chemicals Specifically Be Detected with the Locomotor Response Test in Zebrafish Embryos? Evaluation of human pharmaceutical emissions and concentrations in Swedish river basins. Europe-wide estuarine export and surface water concentrations of PFOS and PFOA. A large-scale model for simulating the fate & transport of organic contaminants in river basins. Estimating emissions of PFOS and PFOA to the Danube River catchment and evaluating them using a catchment-scale chemical transport and fate model. A fully automated approach for the analysis of 37 psychoactive substances in raw wastewater based on on-line solid phase extraction-liquid chromatography-tandem mass spectrometry. Chapter 3 – Detrital Dynamics and Cascading Effects on Supporting Ecosystem Services. A Human Mixture Risk Assessment for Neurodevelopmental Toxicity Associated with Polybrominated Diphenyl Ethers Used as Flame Retardants. Massei, R., Busch, W., Wolschke, H., Schinkel, L., Bitsch, M., Schulze, T., Krauss, M., Brack, W.
Massei, R., Byers, H., Beckers, L.M., Prothmann, J., Brack, W., Schulze, T., Krauss, M.
A sediment extraction and cleanup method for wide-scope multitarget screening by liquid chromatography-high-resolution mass spectrometry. Illicit and abused drugs in sewage sludge: Method optimization and occurrence. Occurrence of drugs of abuse in surface water from four Spanish river basins: Spatial and temporal variations and environmental risk assessment. Five-year monitoring of 19 illicit and legal substances of abuse at the inlet of a wastewater treatment plant in Barcelona (NE Spain) and estimation of drug consumption patterns and trends. “MS-Ready” structures for non-targeted high-resolution mass spectrometry screening studies. Pharmaceuticals and iodinated contrast media in a hospital wastewater: A case study to analyse their presence and characterise their environmental risk and hazard. Drugs of abuse and benzodiazepines in the Madrid Region (Central Spain): Seasonal variation in river waters, occurrence in tap water and potential environmental and human risk. Drugs of abuse, cytostatic drugs and iodinated contrast media in tap water from the Madrid region (central Spain): A case study to analyse their occurrence and human health risk characterization. A temporal high-resolution investigation of the Ah-receptor pathway during early development of zebrafish (Danio rerio). Development and validation of an analytical method based on liquid chromatography-tandem mass spectrometry detection for the simultaneous determination of 13 relevant wastewater-derived contaminants in lettuce. 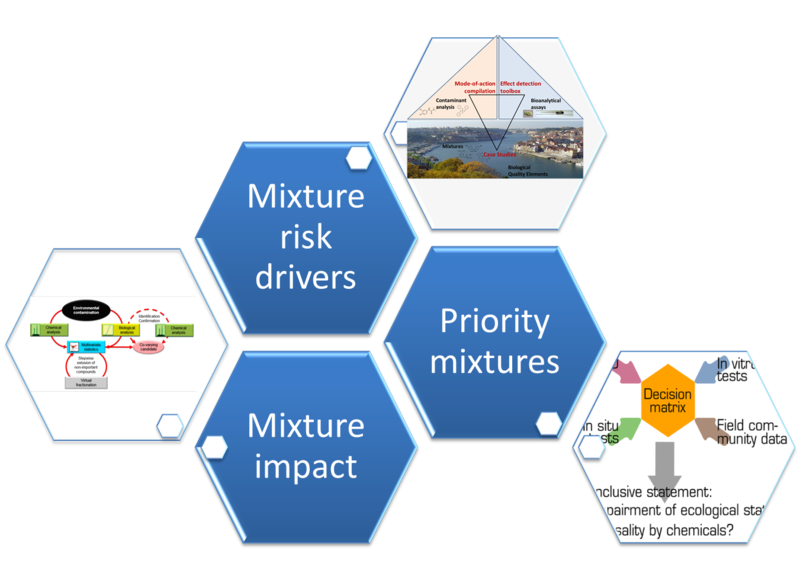 An expanded conceptual framework for solution-focused management of chemical pollution in European waters. Pesticides drive risk of micropollutants in wastewater-impacted streams during low flow conditions. Internal Concentrations in Gammarids Reveal Increased Risk of Organic Micropollutants in Wastewater-Impacted Streams. Identification of Unknown Antiandrogenic Compounds in Surface Waters by Effect-Directed Analysis (EDA) Using a Parallel Fractionation Approach. Identification of Mutagenic Aromatic Amines in River Samples with Industrial Wastewater Impact. Mutagenicity in Surface Waters: Synergistic effects of carboline alkaloids and aromatic amines. Nontargeted detection and identification of (aromatic) amines in environmental samples based on diagnostic derivatization and LC-high resolution mass spectrometry. Environmental mixtures of nanomaterials and chemicals: The Trojan-horse phenomenon and its relevance for ecotoxicity. Solid-phase extraction as sample preparation of water samples for cell-based and other in vitro bioassays. Exploring the oxidative stress response mechanism triggered by environmental water samples. Development of a bioanalytical test battery for water quality monitoring: Fingerprinting identified micropollutants and their contribution to effects in surface water. 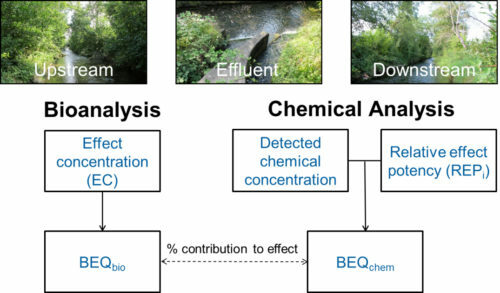 Integrating chemical analysis and bioanalysis to evaluate the contribution of wastewater effluent on the micropollutant burden in small streams. Linking in Vitro Effects and Detected Organic Micropollutants in Surface Water Using Mixture-Toxicity Modeling. What is driving the NF-κB response in environmental water extracts? Degradation of the cytostatic etoposide in chlorinated water by liquid chromatography coupled to quadrupole-Orbitrap mass spectrometry: Identification and quantification of by-products in real water samples. 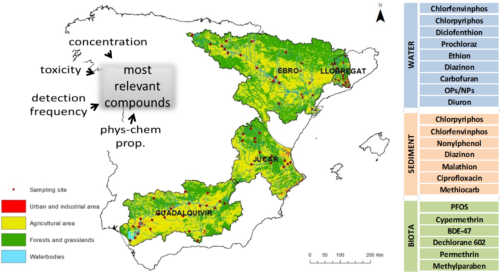 Cytostatic drugs and metabolites in municipal and hospital wastewaters in Spain: Filtration, occurrence, and environmental risk. Transformation of tamoxifen and its major metabolites during water chlorination: Identification and in silico toxicity assessment of their disinfection byproducts. Effect-based monitoring of the Danube River using mobile passive sampling. Risk assessment of pesticides detected in surface water of the Alqueva reservoir (Guadiana basin; southern Portugal). Ecological and ecotoxicological responses in the assessment of the ecological status of freshwater systems: A case-study of the temporary stream Brejo of Cagarrão (South of Portugal). Screening hundreds of emerging organic pollutants (EOPs) in surface water from the Yangtze River Delta (YRD): Occurrence, distribution, ecological risk. Chemical Footprints: Thin Boundaries Support Environmental Quality Management. Beyond Safe Operating Space: Finding Chemical Footprinting Feasible. Eco-epidemiology of aquatic ecosystems: Separating chemicals from multiple stressors. Characterization of iodinated disinfection by-products in chlorinated and chloraminated waters using Orbitrap based gas chromatography-mass spectrometry. Estrogenic activity and contributing compounds in stagnant water bodies with massive occurrence of phytoplankton. 20 Years of fish immunotoxicology – what we know and where we are. In vitro or not in vitro: a short journey through a long history. Environ Sci Eur. ; 30(1), 23. doi: 10.1186/s12302-018-0151-3. Relative influence of chemical and non-chemical stressors on invertebrate communities: a case study in the Danube River. MetFrag relaunched: incorporating strategies beyond in silico fragmentation. Variation in predicted internal concentrations in relation to PBPK model complexity for rainbow trout. Deriving field-based species sensitivity distributions (f-SSDs) from stacked species distribution models (S-SDMs). Prioritizing Unknown Transformation Products from Biologically-Treated Wastewater Using High-Resolution Mass Spectrometry, Multivariate Statistics, and Metabolic Logic. Non-target screening to trace ozonation transformation products in a wastewater treatment train including different post-treatments. Similarity of High-Resolution Tandem Mass Spectrometry Spectra of Structurally Related Micropollutants and Transformation Products. Medium to highly polar pesticides in seawater: Analysis and fate in coastal areas of Catalonia (NE Spain). The transcriptome of the Zebrafish embryo after chemical exposure: a Meta-Analysis. Assessment of a novel device for onsite integrative large-volume solid phase extraction of water samples to enable a comprehensive chemical and effect-based analysis. Perfluoroalkyl substances assessment in drinking waters from Brazil, France and Spain. Open Science for Identifying “Known Unknown” Chemicals. Non-target screening with high-resolution mass spectrometry: critical review using a collaborative trial on water analysis. Integrating bioassays, chemical analysis and in silico techniques to identify genotoxicants in surface water. Data-driven prioritization of chemicals for various water types using suspect screening LC-HRMS. High-throughput concentration–response analysis for omics datasets. Oestrogen reporter transgenic medaka for non-invasive evaluation of aromatase activity. Micropollutant-induced tolerance of in situ periphyton: Establishing causality in wastewater-impacted streams. Determining the presence of chemicals with suspected endocrine activity in drinking water from the Madrid region (Spain) and assessment of their estrogenic, androgenic and thyroidal activities. Diuron and diazinon alter the behavior of zebrafish embryos and larvae in the absence of acute toxicity. 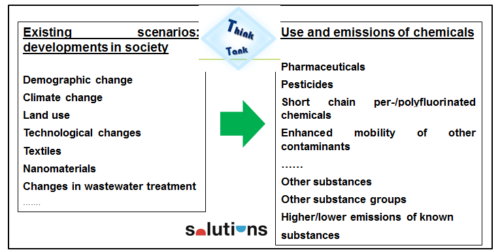 Mitigation options for chemicals of emerging concern in surface waters; operationalising solutions-focused risk assessment. Calibration of a passive sampler based on stir bar sorptive extraction for the monitoring of hydrophobic organic pollutants in water. Mobile dynamic passive sampling of trace organic compounds: Evaluation of sampler performance in the Danube River. A Reduced Transcriptome Approach to Assess Environmental Toxicants Using Zebrafish Embryo Test. SPLASH, a hashed identifier for mass spectra. Benchmarking Water Quality from Wastewater to Drinking Waters Using Reduced Transcriptome of Human Cells. Effect-Directed Analysis of Aryl Hydrocarbon Receptor Agonists in Sediments from the Three Gorges Reservoir, China. Toward Streamlined Identification of Dioxin-like Compounds in Environmental Samples through Integration of Suspension Bioassay. In situ microbiota distinguished primary anthropogenic stressor in freshwater sediments. Identification and ranking of environmental threats with ecosystem vulnerability distributions. Definition and use of Solution-focused Sustainability Assessment: A novel approach to generate, explore and decide on sustainable solutions for wicked problems. Abiotic amidine and guanidine hydrolysis of lamotrigine-N2-glucuronide and related compounds in wastewater: The role of pH and N2-substitution on reaction kinetics. Human Metabolite Lamotrigine-N(2)-glucuronide Is the Principal Source of Lamotrigine-Derived Compounds in Wastewater Treatment Plants and Surface Water. In situ effects of urban river pollution on the mudsnail Potamopyrgusantipodarum as part of an integrated assessment. Find here the February 2014 issue of the Helmholtz Centre for Environmental Research -UFZ- Newsletter with an special emphasis on SOLUTIONS topic. Text in German language.